The looped circuit of Knockreer to Castlerosse through Killarney National Park is a wonderful 5km route that passes through open parkland, golf courses and along shaded riverbank paths. Two 19th century gate lodge cottages en route are joined by more modern additions of a children’s playground and an open air fitness park. The Knockreer area of Killarney is popular with locals and visitors alike and this 5km route is a great way to experience some of the magic of Killarney National Park quite close to the Killarney town. For many years, whenever I ventured into Knockreer, I generally continued on towards Ross Castle. It was only in later years that I started to venture out towards the Castlerosse Hotel through Knockreer. The more recent edition of a new path parallel to the main N72/Ring of Kerry road opened up many new circuits and routes – including this 5km looped circuit below. Because of the relatively recent ‘opening up’ of this route, there is still an element of novelty associated with it for me. As a result it is still that little bit special to me and it never fails to reward anytime I visit. This is a looped route so it is possible to start at a few points along the way. The best start/finish point is at Deenagh Lodge, but it is also possible to start at the Castlerosse Hotel. The route is best done in an anticlockwise direction allowing you to finish on the path that splits the open meadows of Knockreer to reach the Deenagh Lodge. Like many of the great routes and trails of Killarney National Park that are close to the town, the favoured starting point is Deenagh Lodge. Situated just inside the entrance gates to Killarney National Park directly opposite St. Mary’s Cathedral, it is about a ten minute walk from Killarney town centre. A cycle path and footpath along Mission road will take you directly there. Roadside parking is available on Port Road directly outside the entrance but this can be quite busy during the summer months or when services are underway in the nearby St Mary’s Cathedral. The distinctive, thatch-roofed lodge is home to a lovely coffee shop which provides refreshments during the summer months. The nearby children’s playground also makes the lodge a good place to start or finish a family outing. As you pass through the entrance gates, take an immediate right. On your right hand side, you will be following the Deenagh river that you passed over when entering the Park through the gates. The path slopes down towards the riverbank and you will shortly pass the children’s playground on your left hand side. The playground is always busy so take care here if you are running. Note: There are toilet facilities within the playground. As you leave he playground behind, the playing fields of Knockreer extend out on your left. These fields are still a popular place for kids and families to have a kick around with a ball on a sunny day. It was here as a youngster that we played our first games of football. The bushes at the side of the path serving as dressing rooms. Nowadays, there are fitness and exercise machines dotted along the side of the path should you feel the need to do a few sit ups! A lap of the field here is approximately 1km so it’s a good place to do some interval runs or other training exercises if you want to keep off the hard surface of the roads. Early in the mornings, the far end of the field usually plays host to some of the deer who come down for their breakfast before the humans are out and about. As you pass the field, the path winds through the woods and follows the river upstream until it opens up again to a large meadow on your left hand side. Watch out for the horse track that crosses the path at the end of this meadow. This track leads back to the Circular Walk and is an option for a short cut back to the Deenagh Lodge if required. Continue straight on the path towards the Castlerosse Hotel. It was along this stretch that I finished the run leg of my first Olympic distance triathlon. The pain going through my legs at this point often comes back to me when I return! I’m glad I managed to finish, it’s a great location for a triathlon/ironman event. A lot of the Hardman Triathlon run leg covers this route, and also branches off to Ross Castle and Ross Island to make up the 10km distance. The nice flat smooth surface of the path is also a great place for kids to learn to cycle. There are a few little gradients to give them a boost and yet it’s open enough to be able to wobble away in relative safety before any more advanced cyclists come along the path. Take care as you approach the grounds of the Castlerosse Hotel – the driveway to the hotel meets the path so watch out for passing traffic. [OPTION]: There is an option to turn RIGHT here, follow the hotel driveway away from the hotel and rejoin the pedestrian path again. 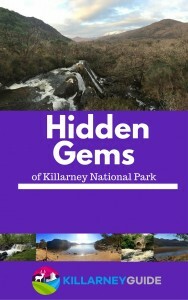 This will take you out towards the Killarney Golf & Fishing club, running in parallel with the N72 Ring of Kerry road. I prefer to follow the rough track that skirts around the side of the hotel (pass the playground and the tennis courts) and leads you around to the back of the hotel. As you rise up a little hill, a beautiful vista of the mountains of Mangerton and Torc mountains rise up in front of you. The golf course at the Castlerosse hotel is to your left and for good measure, Killarney Golf course lies over the hedge on your right. Follow the track down along as it veers left to return back towards the National Park. Here, the path splits three ways. Stay on the path that veers to the right. In less than a hundred metres you will pass over a small cattle grid and re-enter the Knockreer area of Killarney National Park. The paved path in front of you is that of the Circular Walk. Continue straight ahead to head on the return route to Deenagh Lodge. [OPTION] If you’re feeling energetic, you can veer left here and follow the path uphill. This will also bring you back to Deenagh lodge via a shorter but hillier route. [OPTION] If you’re feeling adventourous, you can head right and follow the horse track that will bring you to Ross Castle. Warning – this path is often very rough underfoot and floods regularly during the winter or after heavy rains. It’s at this point that you are likely to encounter some of the local red deer herd that live in this part of Killarney National Park. They are usually visible on either sides of the path along this stretch. If you are here during the annual rutting season in late September/October, take care to steer clear of any stags that are near the edge of the path. They can become quite aggressive and protective of their hinds at this time of year! The path enters a wooded area briefly before crossing over another cattle grate into a lovely meadow known as Cotter’s Field. The path extends out in front of you above the expanse of the meadow with the mountains rising in the background. As we pass over another cattle grate at the end of Cotter’s Field, we join the path that will bring us back to the Deenagh Lodge. [OPTION] Turn right here to go on to Ross Castle and extend your route to an 8km or 10km distance. Turn left to go directly back to Deenagh Lodge although I prefer to go straight on a few hundred metres and return along by the riverbank walk. Once you reach the river, follow the new path to the left (keeping the river on your left hand side) until you reach the next bridge. Turn left here over the bridge and rise up the path back to the Deenagh Lodge. An alternative ending is to stay on the path and don’t cross the bridge back up to Deenagh Lodge. Stay on the path and you can return to Killarney town via Mission Road. The town centre is less than a kilometre from here. The Knockreer Castlerosse Loop is a great 5km run, walk or stroll and its central location in Killarney National Park means that it can be combined with other routes to extend your time in the Park. Make sure to check it out the next time you’re in that neck of the woods. I promise you won’t be disappointed. Victoria Cottage.. on to the majestic Killarneys Golf and Fishing Club on to the Fossa cycle walking path Castlerosse Hotel on to Horse Hill. pathway heading towards Victoria Cottage on to the river walk and back to Killarney House once more.. please I hope like me you shall come enjoy and discover for yourself what a wonderful part of the world we are lucky enough to live in. Thanks for leaving the comment Frank. Killarney National Park is a wonderful place to keep active while enjoying the beautiful surroundings. It is a great resource for all to enjoy.